Disclaimer:- All the information I’ve put here is based on my own research or experience. I maintain and use a modest retro-gaming collection and have spent a lot of time getting everything right, not least tracking down the best SCART leads, adaptors, switchers and hubs. Nevertheless, I’m not an electrician nor do I have a strong electronics background. If you spot a mistake on this page, please leave a comment and let me know. If you’re on this site, then you’re probably the kind of perfectionist that wants the best possible picture from your games consoles. In order to achieve that easily on most machines from the Playstation 1/Sega Saturn era and earlier, you are going to need a SCART cable. SCART cables can produce a full RGB picture. If you’re not sure what RGB means, you might want to start with this RGB primer. So, you know you want RGB and you know SCART can provide it, let’s find out a little more about SCART and how best to put it to work. If you live in Europe then you are probably familiar with the SCART sockets on your TV, but if you’re from the other side of the world, you might never have even seen a SCART socket before. SCART is a 21 pin connector that can carry video and audio. It’s the most common way of getting RGB from many retro consoles. However, SCART can be a confusing standard, to make sure you get the best results, there are a few things you need to consider. 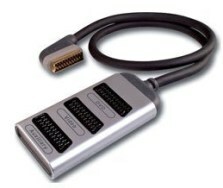 S-Video SCART :- SCART was designed as a multi-purpose connector and so can carry both S-Video and RGB signals, but not at the same time. If you connect an RGB SCART cable to an S-Video SCART socket, you will only get a composite video picture. RGB SCART :- This type of SCART socket will accept a full RGB signal. This doesn’t necessary mean you will get a perfect picture, as it depends on your TV/Video-processors capabilities, though it will be significantly better than composite. Note :- There are SCART sockets on some sets that will accept composite, S-Video and RGB signals. Check your TV’s instruction manual to be certain what types of signal are accepted. Japanese 21-pin RGB :- A rarer, Japanese only standard that uses the exact same connector as the European cables, but with the corresponding pins in different locations. Commonly encountered by gamers on the XRGB series of video-processors. Image taken from Tim Worthington’s website. Link at the bottom of the article. 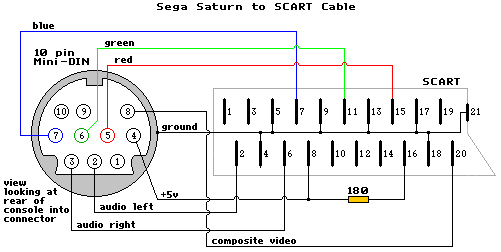 The Saturns SCART cable is straightforward, there’s a wire each for red, green and blue, two for stereo and one for composite video, which is used for sync (more on that later). Notice the +5 volts applied to pins 8 and 16. These are signal pins, pin 8 tells the TV which aspect ratio to select and pin 16 tells the TV to select RGB mode. Pin 16 must have at least 1.3 volts applied to it or the TV will ignore the RGB signal and fall back to composite. Some video processors, e.g XRGB3, ignore these pins entirely and will only display an RGB signal via SCART. Just as there are different types of SCART socket, there are different types of SCART cable. Good quality cables should have all pins connected but of course this is not always the case. If you are buying a SCART cable for your games console, check with the seller to make sure it is an RGB SCART cable and not a cheaper, composite only cable. Do not be fooled into thinking that a simple composite to SCART adaptor will give you RGB quality either. 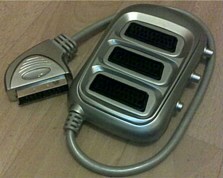 An adaptor like the one pictured on the left is often bundled with games consoles. It will NOT give you an RGB picture. In certain rare instances, you may need a composite sync RGB SCART cable. One such instance is when using the Sega Saturn through the XRGB and DVDO Edge or Gefen scalers. We’ll look at this in more detail in the next section. When sending RGB analogue video, you require one wire each for the red, green and blue components and at least one wire for a synchronization signal. Almost all SCART cables that you can purchase for games consoles will carry composite video on pin 20. When using RGB, this signal is used as a composite sync signal. For most applications this works perfectly fine and it also means that the cable is backwards compatible with composite only SCART equipment. There are instances however, where using a pure sync (also known as a raw sync, clean sync or pure composite sync) signal results in a better and/or more stable picture. Users of the XRGB line of video-processors in particular have noticed that using pure sync rather than sync on composite video can give better results. Usually, to use pure sync, all you need to do is desolder the composite video connection from pin 20, and replace it with a connection to the consoles pure sync line (in the NTSC Saturn’s case, that’s pin 1). This is not always the case however, some consoles may need modifications to make the pure sync signal more stable, or to bring the voltage into line with SCART standards. New retrogamers are sometimes confused when they see cables sold and described as using “composite video for sync”. This does not mean that the cable carries only composite video, of course, merely that the composite video output is used for synchronisation. Passive auto switches – These require no external power supply and have no manual switching capability, instead they simply route the signal from the sockets directly to the plug. In theory, as long as you only have one device powered on, this should work perfectly fine. In practise however, that’s rarely the case and all sorts of strange things can and do happen, from sound not working properly to the picture being dimmed to games consoles turning themselves on even when unplugged from the mains! (due to excessive voltage flowing through the circuit). 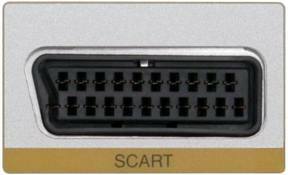 Avoid these kinds of SCART switches (often called SCART blocks), they are not suitable for games consoles. Passive manual switches – These require no external power supply but have buttons or switches that select which input is connected. These kind of switches are cheap and lack the auto switching capability of more expensive models, but are the most reliable switching solution available and can work almost as well as simply plugging the SCART cable directly into your TV. For a hassle free, cost effective way to add more SCART sockets to your retro-gaming setup, this is absolutely the way to go. Even so, care must be taken to choose a good quality switch. The push button switch shown here is not recommended. Because the push buttons do not fully isolate the SCART sockets from each other, the picture from one input can become degraded by adding a SCART cable to another input, even when the other input is powered down and the push button is released. Auto switches with no manual override – This kind of switch requires an external power supply. It will automatically switch to the active input and will often include all kinds of smart switching capabilities. In use, this kind of switch is much more reliable than the pasive auto switches, but can still cause problems with games consoles. The Bluedelta Smart-SCART shown in the picture is one of the most highly rated auto SCART switches available, but still has compatibility problems with certain games consoles, especially if you are using an XRGB3 too. If your SCART cables are correctly wired, however, the better auto switches should work in most cases. 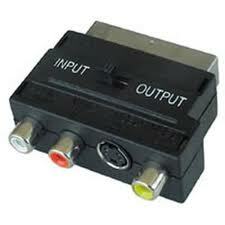 Auto switches with manual override – These are usually the most expensive kinds of SCART switch available. They are very useful as central hubs for bigger, more complex switching setups. The reliability of them varies widely, but most high end models with manual override will work correctly even with unusual SCART cables. 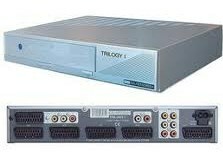 The Trilogy 1, shown in the picture, is very reliable and will route virtually any kind of standard or non-standard SCART signal, including component video over SCART. Unfortunately, as videophiles move away from SCART towards HDMI, high quality switching hubs like this one are becoming harder to find. One of the most common problems encountered with SCART cables is humming in the audio, especially when the screen is particularly bright. As you might expect, this is caused by interference between the video and audio lines. One way to avoid this is to route the audio cable separately from the video cables and then join them again at the SCART end. Buying higher quality SCART cables with better shielding can also eliminate this problem, though for retro-consoles you’re usually limited to what’s available on E-bay and from specialist video-game stores, unless you can find the components to build your own cable. Tim Worthington’s game console SCART diagrams. Shows wiring configurations for most games consoles. Jim’s Aerials – SCART Connectors & Connections. A more video-centric look at SCART sockets and switching. Wikipedia – SCART. Very informative introduction to SCART and SCART cables. Do you think that the RGB scart cable found here will be good for RGB on N64 with my X-RGB3? I’m asking because I know that most third party video cables for nintendo systems are terrible, and I don’t want to have to pay $60 for a nintendo scart cable and the ones on the retrogamingcables website are out of stock. Hi, I have an American NES and a TV with SCART output and I bought a SCART adapter like shown in the picture above but without the s video and I plugged it in and the picture is in Black and White. I dont know what to do and I am new in these stuff. So my question is how can I see with COLORS my NES games? You will need a NTSC to PAL converter or an RGB mod for your console. first of all, thank you! but can you explain to me where can I find a NTSC to PAL converter? And does it matter if I buy PAL to NTSC or NTSC to PAL?